Consumer electronics companies and chipmakers aren’t the only players entering the wearable tech space. Nissan is joining the fray too, with what it alleges is the first smart watch to connect the car and driver. Nissan will be showing off the device — dubbed the Nissan Nismo Watch — at the Frankfurt Motor Show. 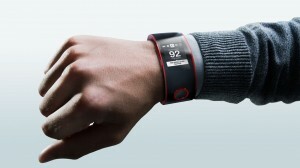 It’s Nissan’s first entry into the world of wearable tech. Nissan says that the Nismo Watch can also track and rate the user’s social media performance across Twitter, Facebook, Pinterest and Instagram using its Social Speed software. Klout for cars? Who knew! The Nismo Watch is an extension of Nissan’s Nismo Lab, which launched earlier this year. The Nismo Lab is a mobile laboratory that captures live biometric and telematics data from Nismo athletes during races. With the Nismo Watch, Nissan hopes to make this sort of data available to the the drivers. With any luck, this sort of technology can also be used in other areas.